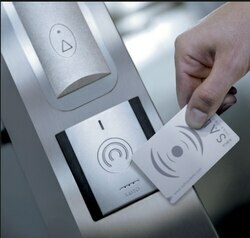 Biometric Lift Access Control System is used with elevator switch to control the entry to the elevator or lift. The biometric fingerprint reader and card reader is used to protect the unauthorized use and mishandling of lift our switch and inner switch panel. Another option is given in the form of keypad to enter password for accessing the lift button or programming of fingers cards by the owner. Call us for more information and implementation of the system.